Several years ago, a friend gave me several little eggs from her beautiful Silkie hens. I kept three of them in the refrigerator. I wondered if they would dehydrate (mummify) or simply rot. After about a year, they began to rattle when I shook them. I knew the yolks had separated from the shells. One night, I decided to place one on an egg stand. 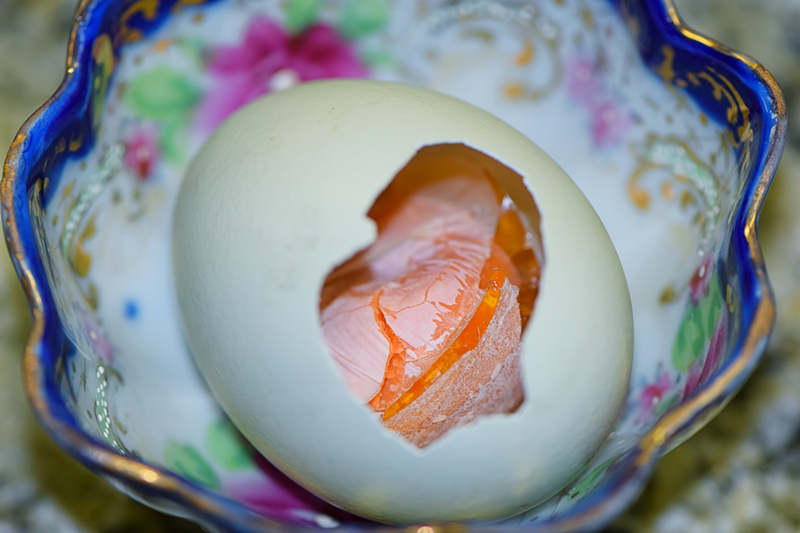 When I reached for the stand, I felt my thumb break through the fragile shell. I photographed one of the eggs that is much smaller than it appears in the photograph. The inside of the egg looks soft and fresh, but it is not. It is as hard as a rock. in the Easter tradition in which I grew up. There is something reassuring about the keeping of the old traditions, I think. MeMe was kind enough to send a photo that I requested. The kids always forget my request! Hello George, I looked for you on Facebook today, and saw you had left. I wanted to say hello and ask if you had tried the new Lightroom CC 2015. Also, I just wanted to see how you are doing. I never post a think on WP where I do not think of you. Hello George. I am so pleased to hear from you, and quite excited and relieved to know you are not ill. Honestly, my worry about you had really sat in a deep and sorrowful space in my psyche. You are such an important influence for my work, and while you have not seen my posts on my website (WP is so challenging at times) there are things that are there. My photography work has grown by leaps since 2011. I had a large 10 page photo spread in a nationally published wine magazine. I was recently featured as an artist in another publication. And, of course, I still write about my beloved Juliet -http://housewrighter.com/happy-sixth-anniversary-juliet/ . I think if you were to sign up on my site you would get email notifications when I post. My longterm goals remain to sell books, speak to crowds, and do work that pleases me, above all things. I am now nearly 4 full years as a full-time artist. I am finally earning a little money, but mostly I am still learning to craft my stories. Your belief in me, when few had any idea what I was doing (including myself) remains a lamp post in the darkest avenues of my neuro-pathways. I am not nearly as communicative as I once was. I don’t love that about myself, and I am hoping to return to a better level of letting those I care about, know that I do. I keep up with you, and admire you greatly. Thank you for this note, and for being you. Actually, I think Faberge eggs are a bit vulgar. There’s nothing wrong with your aesthetic sense, George, else you wouldn’t be able to make the beautiful images that you do. As for the book making, I’ve never done it. I have Blurb bookmarked as a possibility but have made no steps whatsoever in that direction. Do you mean you’re too tired to set it up? I wish I could help you, George but I have no idea how to do it. I enjoy the delightful comments that my friends leave here, too, Jo. There are so many interesting people here. I know lots of them that I just don’t get around to visiting any more. I don’t have the stamina I once had so I sleep too much! And the animals require a great deal of my time, but I’m determined to keep them. I don’t remember paste eggs??? Poor Lance! An experiment gone horribly awry! Can you imagine the stench of rotten egg? 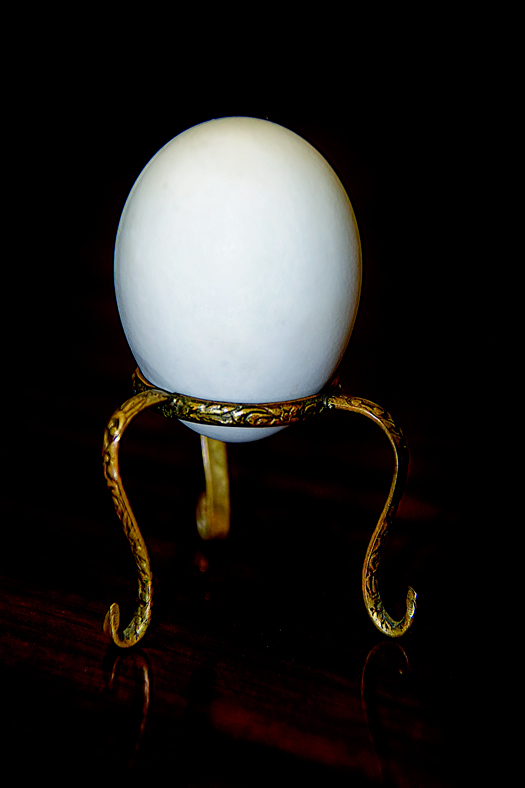 I almost bought a goose egg with an antique egg stand the other day on eBay. I should have sent it to Lance. Said it was for carving. At least it was old and didn’t have the insides! Chuckle… I’m sure he won’t try that one again! He paints such beautiful miniatures. He sent a painting of Rita a year two ago. I love it since her expression and posture are perfect. He’s such a good person and a gentleman if I ever met one. As well as a very talented and well known artist. I missed him when he wasn’t here for awhile recently. I love it that you have a “delightfully silly husband”. The very best kind, you know. So was mine! Although, that damn singing in the morning shower drove me nuts! 🙂 Thanks for stopping by, Jo! Well, Jo, you’ve been so very kind to me. You will never know how much that means to me. 🙂 Thank you. Hi, Elisa! At least your egg didn’t explode like Lance’s goose eggs! Good advice for the Easter Bunny! Eye Rolls are universally genetic, I think. I never knew a kid who had not mastered the art! Kelli was particularly adept at it and has passed the art along to Charlie! Thank you, Elisa! Yeah, I don’t know who designed women’s underwear, but whoever it was should have been shot where he stood. You notice I am blaming it on some poor man. It was probably a middle-aged woman! My mother’s generation wore corsets! At least we struggled free of that one! I had a great Easter. The kids go to the other grandmother’s house where all of the traditions are kept. 🙂 Charlie loves it since they live in the country. This year, they had newborn goats. He carried one around petting it! We have a very small family so it’s good that he can visit them often! Take care, Celestine! Hi, Rob! We learn from our elders. Otherwise, we’d be more savage than we are! Chuckle… The passing of generations and the passage of tradition and life lessons from one generation to the next is invaluable. Hope you and Linda are well! 🙂 Thanks, Rob! Hope you & your family have a bountiful Easter. Hope you family did, too, Joseph! Everybody is doing well. Kelli is recovering from her knee injury (tubing in Steamboat Springs in February) through persistence and therapy following her surgery. Charlie is doing well in his home school program and I am persisting in my old habits… Chuckle… Thank you, Joseph! I was wondering what the heck was in the egg! It sort o looks like mandarin oranges! I’m always late to the party, please egg-cuse me, my dear. I love all the egg art and stories! I paint eggs betimes with miniature scenes and birds and such. Anyway, my sister gifted me with a couple of peacock eggs. Not knowing how fresh they were, I decided not to try and blow out the contents but do as you did–let them sit and then wait for the yolk and insides to dry (as I’d read was/is done by Ukrainian egg designers). Then one night while just drifting off to sleep I heard in the next room (at that time I lived alone, so any noise beyond my own was alarming) this great loud POP! explosion. There was rotten peacock egg EVERYWHERE across the living room. It was, by far, the (pun alert) fowlest cleanup job I’ve ever had to carry out, and that includes dealing with an infant’s surprises. 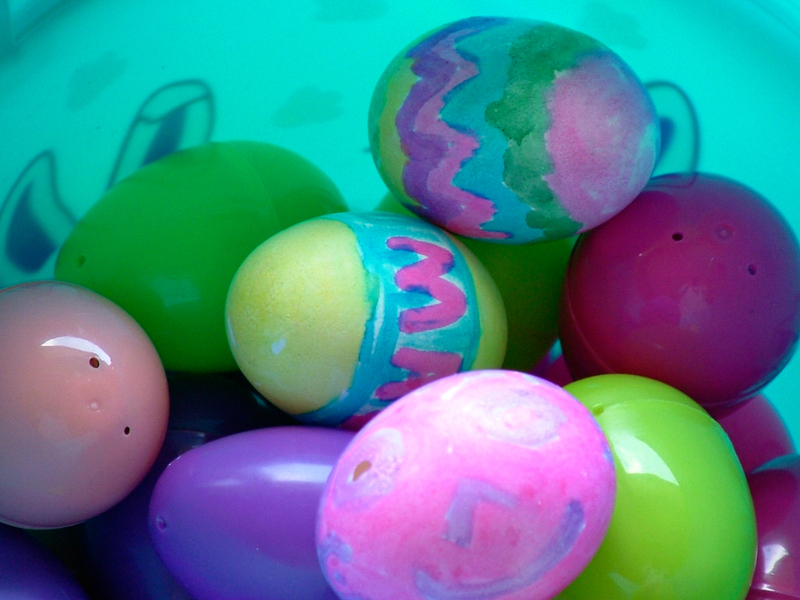 It is Easter Monday here in Canada–a statutory holiday–so everyone is off work. Postal workers get both Good Friday and Easter Monday off. I do hope you are relaxing as well. The “mummified” egg in the first picture is certainly a conversation piece befitting of the Easter season. I bet you could show this picture to any theological class at any seminary and engage in hours worth of parallels, analogies and such. I can imagine that, too. I was surprised in the series on “Finding Jesus”, by how little Christians know about the forty days between the crucifixion and the ascension. That episode was fascinating to me. Having grown up in a Methodist church and having taken two semesters of Bible history in college, I simply did not find out much about that period. Or the ancient texts that were omitted from the official Canon approved by bishops appointed by Constantine in his effort to consolidate the various Christian sects throughout his empire. The fact that he declared Christianity to be the official religion in something like 312 AD cemented Catholicism as the official Christian faith. I guess. Since there is considerable difference in opinion about all of it. I was astonished to discover that in 1945, other ancient accounts were discovered in a six-foot tall jar buried for centuries. All of it is fascinating, I think. Have you watched any of the series? When I grew up, I simply assumed that Christ was risen and ascended after having identified himself to the disciples, very shortly after the crucifixion. I should have learned a great deal more about the history of the time than I did or that I recall. Ah, Francis! I’ve missed you. I don’t follow the reader much anymore, but I really do think of you often. I laughed big time at the evil Chocolate Bunny! Thank you for the laugh. I hope you are well. And, I hope the weather is warmer there than I think it is! 🙂 Thank you so much for thinking of me, Francis! HAPPY EASTER!!! I wish we were there with all of you!!! Yeah, me too. 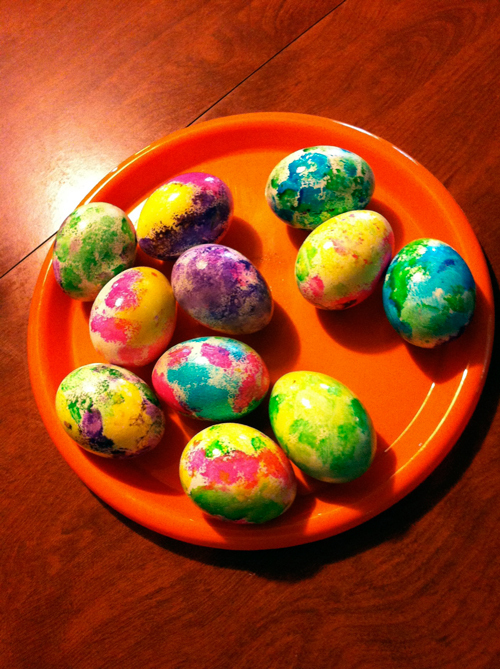 Did you color Easter eggs with the kids? Never mind…. You’re as likely to do that as I am, I think! Haha! Hugs to you and Hazel! Have an awesome Easter with Kelli, Charlie and the family! Love u!